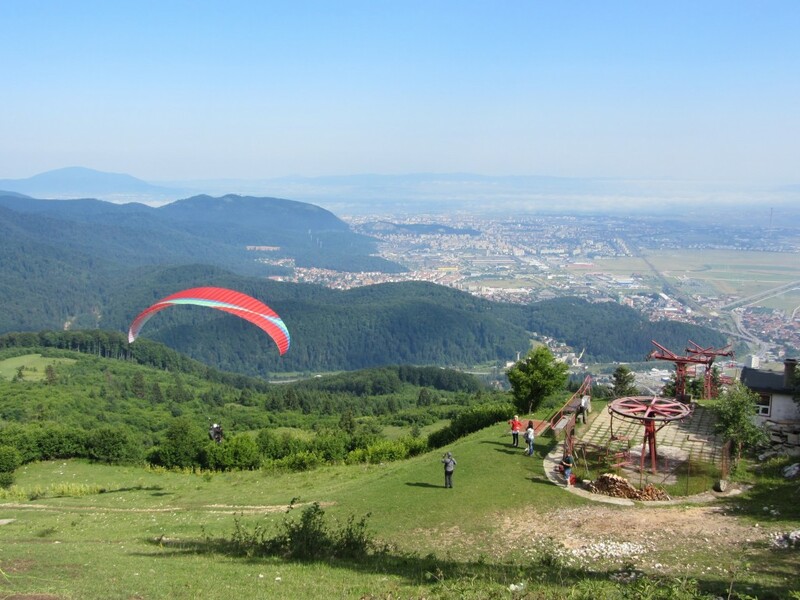 Romania is not only a gorgeous lesser-known part of Europe perfect for a holiday, it’s also place with varied (XC) paragliding possibilities. It’s not as easy to clock XC kilometers as in the Alps, but you get a lot more variation in return, from high mountains to flatland flying. I secretly fell in love with the country when I was backpacking there last year, so when I heard that two locals would start organizing paragliding tours, I booked immediately, knowing that within Europe I could get there for cheap with Wizzair (either to Bucharest, 3h by train, or Cluj-Napoca, 6h by train). I’ve been staring out the train window for a few hours now, watching the Transylvanian hills roll by, when I get a message from my guide Mircea from Transylvania Fly. “Hey, I’m not sure if I can come get you from the train station, as I’m currently dangling from a tree.” I’m surprised but tell him that it’s no problem, I’ve been here before and will find my way. The hills become larger and soon morph into the mighty Carpathians, the mountain range that divides Romania in two. It’s kind of a mirrored L-shape, and the city of Braşov is approximately in the corner of the L.
It seems like Mircea (pronounce like: mirtsja) has managed to get out of the tree safely, as he’s waiting for me at the train station. We make some chitchat, then go to the hotel where I meet Ron, a slightly older American helicopter technician. (Later in the week a Belgian couple joins too.) Ron and I soon get along great, during dinner he tells stories about working on McMurdo station, a large research base on Antarctica the size of a small village. The alarm sounds early next morning, too early for my biorhythm as I’ve been exploring the nightlife in Cluj-Napoca the past two days with local friends I made last year. When I finally do pry open my eyes the car has already arrived at Bunloc, a convenient little flying site nearby. We go up with the chairlift and have a nice first flight. In the early afternoon we even manage to do some nice thermaling. I feel right at home in this Romanian air! It’s time for lunch, so we find a nice restaurant and order ourselves some drinks. Crinu, the second guide, joins too. I like the vibe so far. There’s this wonderful rhythm of having fun in the air, having some food, and then relaxing. Meanwhile, Mircea tells about his tree adventure. It turns out that he took too much risk by flying out over the forest too far. He couldn’t get back and had to land in a tree. He got out by securing himself and climbing down. “Always remember, trees are our friends,” laughs Crinu. We toast to this happy ending to Mircea’s tree adventure. The day isn’t over yet so we take Mircea’s 4x4 BMW to another takeoff half an hour from the city. We can’t get to takeoff by car alone, not even with a 4x4, so we park the car and start walking up to takeoff. A farmer comes by and tries to tell me all kinds of things in Romanian, while waving his hands around. I join him in his verbal theatre, spreading my arms and making bird sounds. The takeoff is a large meadow in a saddle. You can’t fly here with strong winds because of the venturi-effect, says Mircea. I take off first and can pass above takeoff a couple times, while happily shouting and waving of course, but when Ron and Mircea take off the wind starts to decrease. We do manage to stay up for a little while. When we finally glide to landing, the sunbeams illuminate the hilly, colorful landscape. Hot damn, this is a gorgeous sight, I think to myself. The next day we even manage to do a small cross country flight from Bunloc. We don’t get very far, as the little hills further from takeoff are not very thermally active if the conditions are not booming. The retrieve comes in handy, Mircea picks us up almost before we’ve got our feet on the ground. Before we know it, we’re having lunch in another nearby restaurant. At the end of the afternoon Crinu brings us to a small hill to do some soaring. It’s like a little pimple popping up from underneath the flatlands, half an hour from the city. The wind is too weak to stay up for more than a little while, but the whole slope is grassy so there’s enough room to play around. I enjoy myself while Ron looks a bit grumpy as his Gin Carrera, an EN B wing designed as EN C-wing, is everywhere except straight above him. I jokingly ask if he’s trying a helicopter trick, and we laugh. Today we drive one and a half hours north, to near a town called Miercurea Ciuc. We arrive at a takeoff nearby, which is when I get confused as it resembles a practice hill. How are we ever supposed to climb to cloud base from here? After a little while the thermals get stronger, so we get in the air. Miraculously we even manage to climb! After the thermal cycle finishes the fun is over though, we have no choice but to land and go back up again while sweating in our coats. “The thermal cycles are still too short,” Mircea says, but if we wait a little we can stay up, he assures us. And he was right, because we climb up effortlessly when we take off half an hour later. A few big clouds make flying far not seem like a very good idea, but we can stay up in the air as long as we want. What a surprise for such a silly practice hill! The next day, a local pilot manages to fly 70km from this takeoff. After landing, Crinu brings us to a local Italian hotel, which has been recommended to him by some other pilots at takeoff. The owner serves us some authentic spaghetti. I ask for a knife and start cutting it, just like I’ve been taught back home. This prompts the Italian owner to stare at me like I’m committing a crime. The others jokingly try to convince me to ask some ketchup too! Climbing to cloud base at Miercurea Ciuc. We took off from down there! Today the wind direction is south-east, which makes it possible to fly from Postavaru, a mountain south of Brașov with many ski slopes and resorts on it. A large cable car takes us up. From here we can see the entire city to the north, and the Bucegi Mountains to the south. After checking the wind direction at multiple points on the peak of the mountain we take off, and shoot to cloud base like it’s nothing. I decide to fly west, but after twenty minutes I start to lose altitude pretty quickly. Flying back is no option because of the dense forest without landing options. 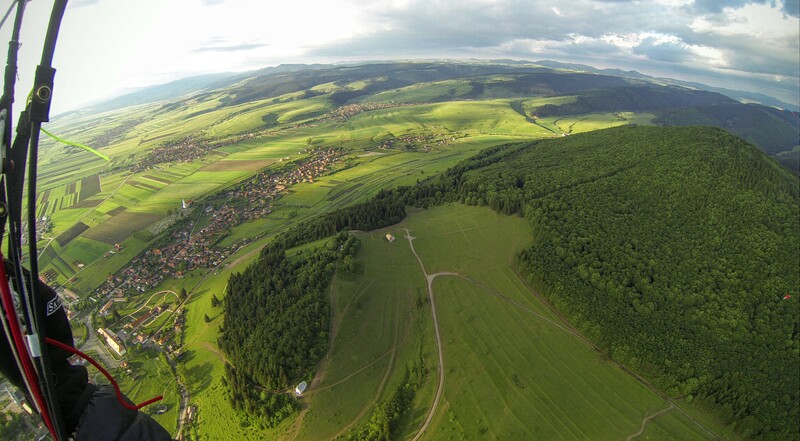 Eventually I land in a small village at the base of the ridge. Crinu contacts me on the radio and decides to land nearby, so that we can have lunch at a restaurant with trout pond nearby. The hired retrieve driver joins too, and together we eat some fresh trout. Landing out in Romania is always rewarding! Ron flew the other way and has managed to cover 38km. Quite a performance as cross country flying is quite technical here. Mountain ranges mostly stand by themselves, there are few continuous mountain ranges like in the Alps. It is, however, easy to fly into the flats here if conditions are really good. Today there’s a surprise: we go enjoy ourselves at the local swimming pool. On our way there we stop to pick up Christie at the shopping mall, a local pilot who flew over the city and landed near this fastfood-paradise when he got hungry. We go into the shopping mall and get some groceries at the largest supermarket I’ve ever seen. The shelves stretch almost until cloud base, housing pallets full of new products waiting to fill empty shelves. Grocery shopping takes a long time here, especially if you’ve forgotten something and need to walk three hundred meters to go get it. It seems very unpractical to me, but maybe that’s because capitalism is relatively new here and the “bigger = better” mindset still reigns supreme. Maybe that’s also the reason that there’s so many expensive German cars here, especially for a country that’s not very rich. The stalinist communist regime of Ceaușescu ended in 1989 with a revolution. His secret service was the largest in the world, they even replaced every single telephone in the country by units with special eavesdropping devices. In that time, even your brother could secretly be an informant. There’s still some corruption in the country, but at least it’s doing much, much better than back then. After the swimming pool we go to a traditional Romanian restaurant, still steaming from the sauna. The food is cheap here, to spend more than ten euros takes some effort. I’ve been getting curious as to why Mircea and Crinu organize these trips. It’s not exactly a “get-rich-quick” scheme and it costs huge amounts of time and effort: we keep them busy from dusk ‘till dawn. Sometimes they fly with us, at other times one of them stays on the ground to provide the retrieve, and sometimes Crinu flies tandems. Next to that they drive us to all these flying sites, sometimes more than one a day. 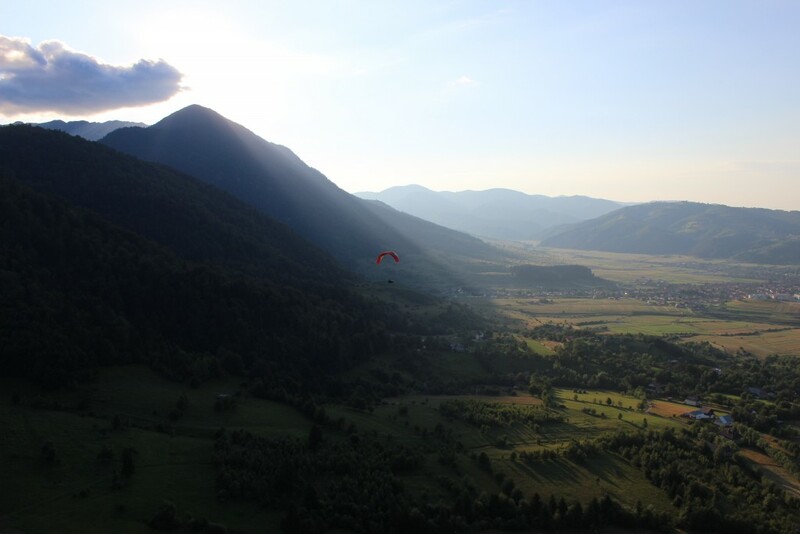 After asking them some questions, I find out that they do it simply because they like to see the smiles on the pilot’s faces, and because they like this paragliding lifestyle. Crinu already showed that it’s not about the money—if he doesn’t want to fly any more tandems, he’ll send his customers to one of his colleagues. Don’t worry, he radiates. Anyway, I think that they’re doing pretty well. I’ve never seen so much variation in takeoffs and scenery, from flatlands to huge Alpine-like flying sites, and we haven’t even been to all the local sites. We didn’t, for example, visit the mighty Făgăraș Mountains as conditions can be quite fierce in July. August and September are the better months for that mountain range. We’ve been flying so much that we haven’t been able to do many cultural activities. We haven’t visited the famous “Dracula” castle Bran, for example. Or the old city centre of Brașov, which is definitely worth a visit too. Anyway, it’s reassuring that we could have done many things even if the weather hadn’t been this great. Romania’s local liquor is palinca, you know, one of those highly alcoholic drinks that are supposedly so very traditional. Every country has one. We dedicate our last cheers of the week to flying like a bird, to the new friends we made, and to all our adventures. Needless to say, my train ride the next day feels a little melancholic.